In 2001, the Bet365 sportsbook first came online. They also accept land-based wagers, but their online and mobile operation is what we’re focused on here. They are licensed in the United Kingdom and Gibraltar for offering online sports betting, both of which are in the highest tier of available jurisdictions for licensing. 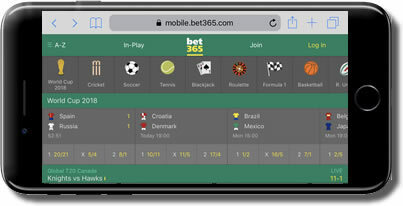 The Bet365 Mobile Sportsbook also has a reputation for being extremely reliable, provides a user-friendly, enjoyable betting experience for their users, and it’s hard to find a weakness anywhere in their entire operation. It is a no-brainer to include them in our reviews of mobile betting apps that we trust. Bet365 Sportsbook does offer multiple bonuses and promotions to both new customers and returning bettors. To see their current offers, you can visit their website or mobile betting app for more information. Something punters have to understand about the Bet365 Mobile Sportsbook is that it was designed from the ground up so that every aspect of your experience would be open to as many people as possible. On the interface side of things, it has been set up to accept as many different operating systems, smartphones and tablets as possible. The platforms with the greatest flexibility in this industry are web-based, so that’s what they have used here. As a result, all you have to do to get started playing with Bet365 for mobile is go to their website and log in. After you have logged in, the interface itself will expand accordingly to fit the screen size of your device. No matter if you’re using any of the popular operating systems on your device like iOS or Android, or even if you’re using the less popular OS options like Blackberry or Windows Mobile, their interface will load up for you just the same. This is also the case for both smartphones and tablets, and everything will scale intelligently and automatically to fit your screen. When you first log into the app, you will be taken to a simple lobby screen that will include a few pieces of information, like the most popular events that are being wagered on that day. Any other notable markets will also be immediately available, as are the list of the most popular sports that punters are wagering on that day for easy access. The selection of markets at Bet365 is absolutely huge, and it’s based around the idea of covering as many leagues for as many sports on as many levels as they can. This also includes horse racing, political elections and other types of specials, even betting on popular lottery outcomes. When you use the mobile interface, you’ll be able to place wagers on football/soccer, American football, baseball, MMA, basketball, boxing, financial markets and tons of other events. On top of that, everything is set up to make it really easy to find what you’re looking for. Whenever you start from the main lobby area, you’ll be able to pick from a list of sports. Some of these listings will take you directly to the available games, and others will take you to a list of leagues or countries where there are leagues so that you can zero in on exactly the set of games you’re looking for. Within a few taps on your screen, you’ll be ready to make your wager and put your money up, and with this high level of organization, it’s clear that everything is designed to make your experience as smooth and intuitive as possible. There is a tremendous number of different payment options available in the cashier section for the Bet365 Mobile Sportsbook. The basic idea is to give punters as many options as possible, and this includes the most popular credit cards, electronic wallets and alternate methods of making deposits and withdrawals. MasterCard, Maestro, Visa, Skrill, PayPal, Neteller, bank transfers and a sizable selection of other options can be used for payments here, and that is really just scratching the surface. Some of their secondary options are regional in nature, so the payment methods available to you will really just depend on where you’re playing from. The customer service team for Bet365 has won several different awards from different places over the years, and they maintain some of the best customer service in the entire industry. You can contact them with a telephone call, email or through their live chat service. All of these are convenient from your smartphone or tablet, but the live chat probably gets the most attention from mobile players since it gets you assistance right away with a minimum amount of fuss, and it’s usually only a tap or two on your screen away. It’s clear beyond the shadow of a doubt that the Bet365 Mobile Sportsbook offers one of the best mobile sports betting options available in the industry as a whole. They have a really wide range of markets with a lot of fun and valuable promotions, and their interface is also set up to work for a ton of different devices. They have a rock-solid operation in every aspect of what they do, and between that and their superb customer service and reputation for taking care of their punters, it’s hard to find any reason not to place your bets with them.